A brand new podcast hosted by Danielle DiNenna and Jack Woods, Slapshot 615 exclusively focuses on the Nashville Predators from the perspective of two high schoolers! Jack is currently enrolled as a senior at Centennial High School in Franklin, Tennessee, while Danielle is a junior at Clarksville High School. Both are fresh faces to the hockey community and to Penalty Box Radio, and are excited as ever to be churning out content! The first edition includes (but is not limited to) recent statistics, the short Predators, who’s been the best defenseman thus far, some areas where improvements could be made, the impact of injury, Kevin Fiala, first line production, and what’s coming up in the near future. These podcasts will be about recent play and recent Nashville Predator standouts, and will be made on a bi-weekly basis! 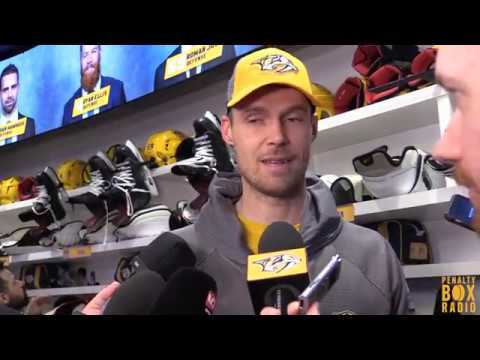 Recorded in the private study rooms at the Nashville Public Library, they are merely three blocks away from the home of the Nashville Predators. Both are avid Predator fans, and look forward to analyzing the team in a more in-depth analysis. More content being produced right now- stay tuned for more Slapshot 615!